I took several different blocks to stitch on - this is block 3 of A Primitive Garden, by Primitive Gatherings. The Sew A Long starts in a couple of days - if you want to join us, go to our Facebook Page and ask to join. I took this all the way to Minnesota and back, and didn't work on it at all. I did stitch on a couple of Merry Christmas blocks while I was there. Finished the binding on Sophie's Garden by Pam Curo right before I left. Callie gave it her paw of approval. Mom and I went with Aunt Nancy to her quilt club meeting when we got to Minnesota on Monday night. Emily from Red Button Quilt Company was the speaker. She shared tons of her little quilts, and even passed them all around the room so we could see them up close and personal (and fondle them, of course!). Emily adds a lot of little simple embroidery that just makes them extra cute. I took this one for my SIL - her mom makes tons of yo-yos and is always looking for ideas on how to use them. This is one of my favorites - those are my size of nine patches - lol! Love the little pumpkins in the center and look at how the vine in the border adds to it. She also uses lots of tiny buttons in her designs, and if you buy a kit, there is always a red button included (along with any of the buttons used in the quilt) - fun! Another favorite - those tiny flowers are really buttons. And here is a shot of what I woke up to each morning - a nice view of the lake. The temperature in northern Minnesota was much cooler than it was at home, and I loved it! I meant to go out and take some pictures of their log cabin but I totally forgot! I think I've shared pictures of it before - it is beautiful, I really love it there. On Tuesday Aunt Nancy took us to several quilt shops and we even went clothes shopping. We had to pull over and take a picture of this billboard along the way - I thought it was funny. I have lots more to share from our trip and from the quilt show, but will save that for the next post. The show in Springfield, MO was a good one! Lots of people and so many pretty quilts. We went early on Saturday so that I could look at all of the quilts. I just made a quick run through and took a bunch of not-very-good pictures. There was bright lighting overhead that made my pictures worse than usual, if that's possible. This one just blows my mind. The lady who made it visited my booth. She claims this is not hard to make. Makes my eyes crazy to look at, and my head hurt to even think about making it. I think it's amazing. A lot of the quilts that I took pictures of are not something that I would ever make - really bright and modern, but I sure do appreciate them. I love this - I think it's the black background and of course all of the little pieces! I love the border on this one - I think a pieced border adds so much interest to a quilt. Another black and bright quilt - isn't it gorgeous? A Ginny Beyer design that I have always liked. I guess you can tell that these black/bright quilts really caught my eye! Loved this one - it was a beautiful anniversary tribute quilt and had several personal things attached lace, a necklace, etc. I took this picture for my chicken loving niece! I love this design - on my I-need-to-make-this list! 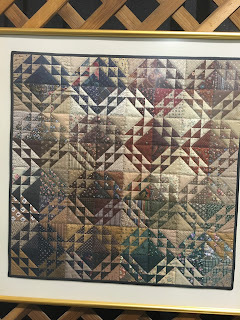 They had an area that featured quilts by Anna Day - they were all framed and very nice. I love the way she uses color - especially the light/background fabrics, love how they sparkle. Great small stars - loved these earthy colors. There were lots more, but this gives you a good idea of all of the beauty at the show! 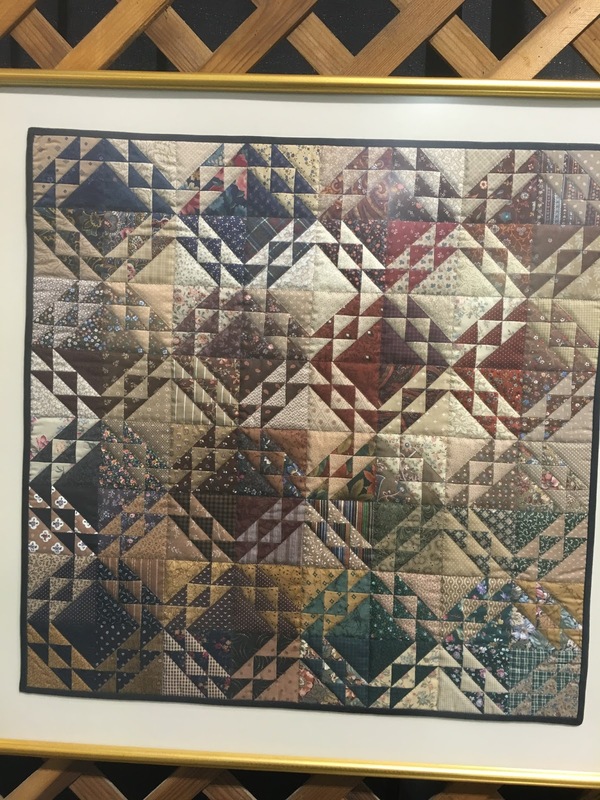 So many talented quilters. And now I'm packing up for the next one! My mom and I leave for Minnesota on Monday. Yikes! Still lots to do - so I better get busy! Have a great weekend, and come and see us in Walker, MN next week!